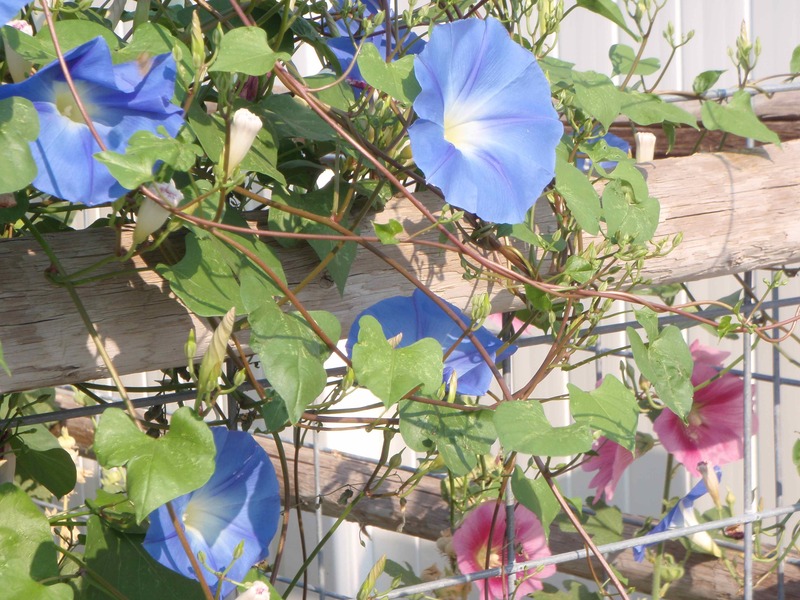 The Heavenly Blue Morning Glory has the misfortune of being related to that hideous bind weed, commonly known as morning glory, which is an invasive weed that threatens every gardener’s sanity. But everyone has a relative like that: the person who prejudices all acquaintances against the family by being continually obnoxious. 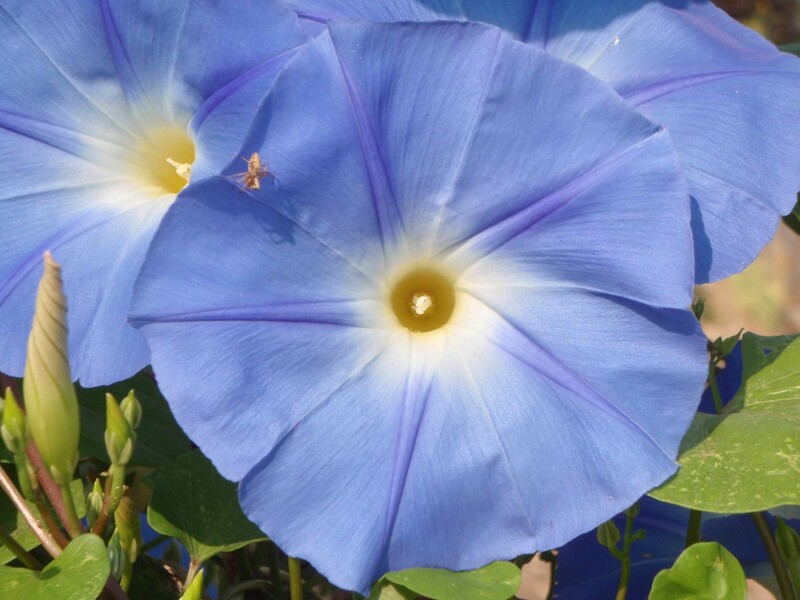 Heavenly Blue Morning Glory, on the other hand, is a touch of cool blue paradise that won’t give you any trouble. It is an annual vine that germinates, when the weather is getting reliably warm, in moderate numbers from last year’s plant. 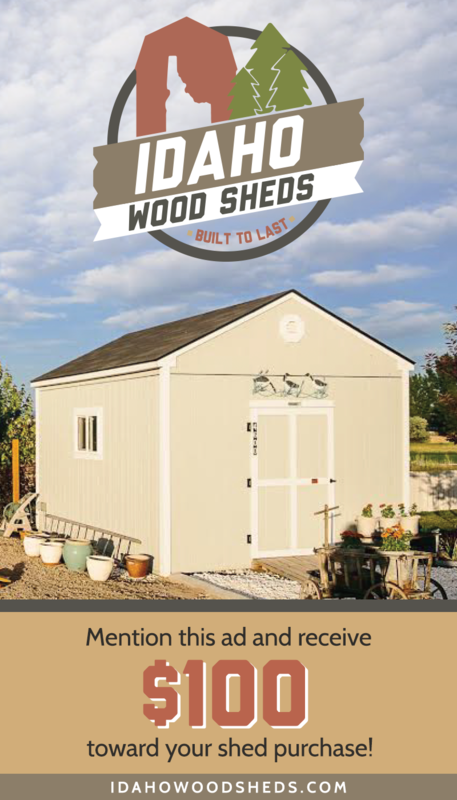 Or it can be started in a pot easily. The first leaves are purplish green, sort of square, and notched in on the outer edge. The seedling is large enough to transplant easily to various locations around the yard, which I do every year, liking to mix up the landscape combinations. 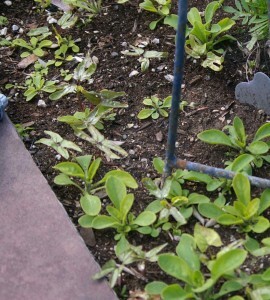 The plant will thrive in full sun, but can be coddled if its beginnings are in shade, as long as it will be able to reach the sunlight in its juvenile stages. However, if there is too much plant life around it, especially in the shade, it seems to be a favorite snack of the critters that live there. Here today, and gone tomorrow. If it is in too much shade, the vine will flourish, but you may be short of flowers. 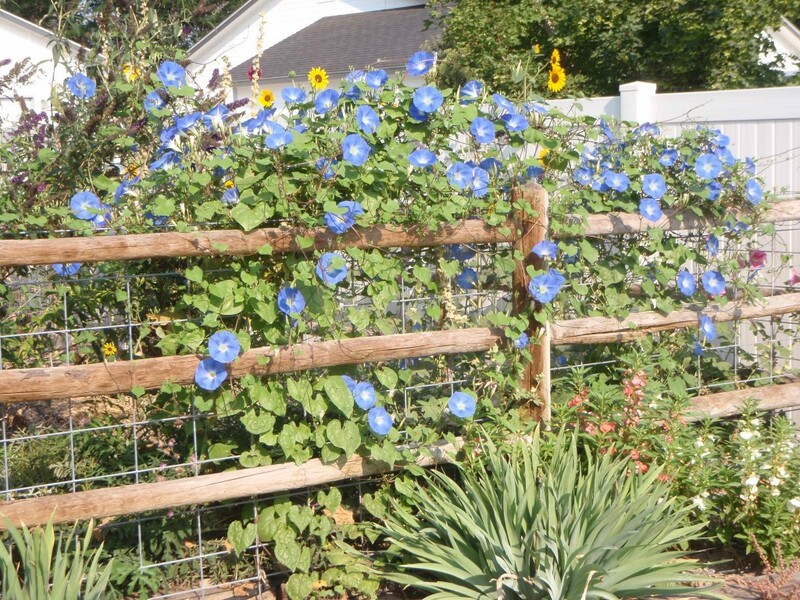 One year I grew a row of sturdy sunflowers (which sprout a few weeks before it), later placing a few heavenly blue morning glories along the base. By mid summer, the living trellis of sunflowers was beautifully smothered in a cloud of blue, rising eight feet into the air. Alas, it was in the days before my digital camera and only lives on in my memory. I’m told this was my great grandmother’s favorite flower, and perhaps you can see why. Its 3-4 inch deep sky blue blossoms have a silky look to them, tempting the seamstress in me to try to sew them together for a dress. The heart shaped leaves cascade like a waterfall, setting off the flowers to full advantage. As the word “morning” might suggest, the flowers do tend to close up in the afternoon. I find that here in southwest Idaho, they are generally pretty and open until about mid afternoon, depending on the heat of the day and how well they have been watered. 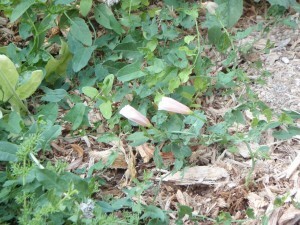 Below, you can see a mix of all three stages of the flower. Once the plant has grown up a bit from the ground, it doesn’t seem to have any pests that harm it. I’ve never had it get a disease either. 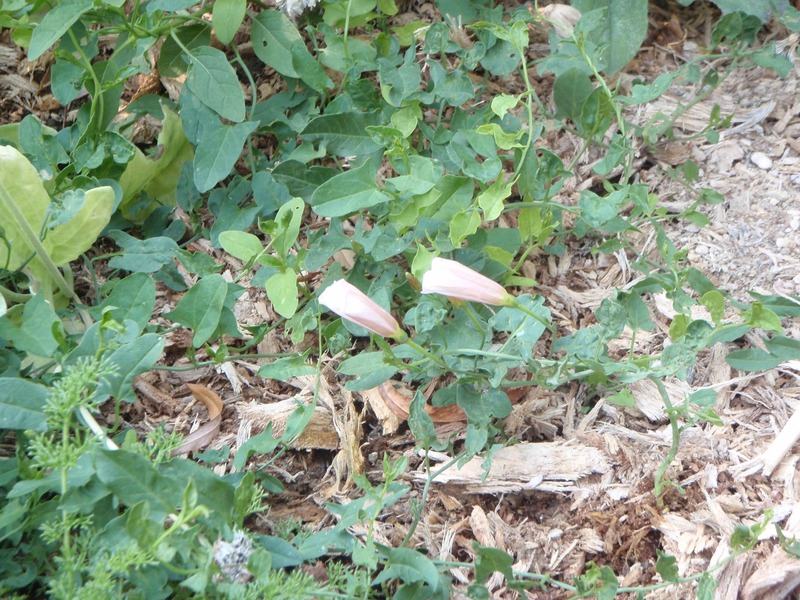 Not even when powdery mildew was settling on its wicked cousin, bindweed. If you plant it, be sure to put some of it somewhere you will pass on a regular basis. Mine is along the fence at the entrance to my driveway. Every time I go by, I stop and sigh a moment in admiration, and feel my heart get a little lighter.